Sacred Games is the first Indian Netflix original series. Based on Vikram Chandra’s novel, it stars Saif Ali Khan, Nawazuddin Siddiqui and Radhika Apte. The eight-episode web series will begin streaming from July 6. The eight-episode web series will begin streaming from July 6. A cop without a case, a criminal without a code, a cat-and-mouse chase and a city under crisis… Netflix’s latest web series Sacred Games is just around the corner, and its first trailer is teasing fans about a lot of thrill and action. Starring Saif Ali Khan, Nawazuddin Siddiqui and Radhika Apte, the series is directed by Anurag Kashyap and Vikramaditya Motwane. It is based on Vikram Chandra’s critically acclaimed novel of the same name. The trailer opens with Nawazuddin challenging Saif to save his city from an unknown emergency. While Saif, a cop, isn’t able to understand Nawaz’s cryptic warning, he soon begins to decipher his caller’s words only to find an upcoming catastrophe. Sacred Games is a story of betrayal, glamour and grit that’s set against the ever-changing backdrop of Mumbai. Sacred Games is the first Indian Netflix original series that shows an intriguing world set in the dark underbelly of Mumbai, where politics, crime and passion come together in a deadly game. 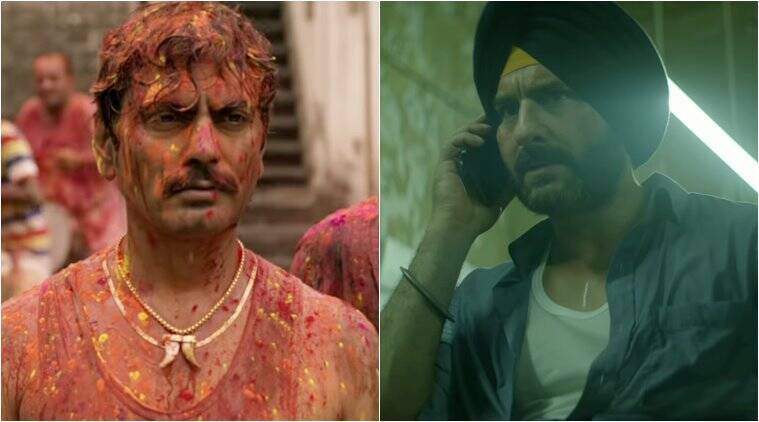 As per the synopsis, Sacred Games follows the riveting journey of Sartaj Singh (Saif Ali Khan), a seasoned, cynical police officer, and Anjali Mathur (Radhika Apte), an intelligence officer, to the centre of a mysterious web woven the powerful criminal overlord, Ganesh Gaitonde (Nawazuddin Siddiqui). Along with the twists in the plot, even the audience is taken through the dark alleys of Mumbai, with Ganesh and Sartaj tightening their grip on each other and staking everything on victory, including the city itself. While there have been many crime dramas (films especially) which deal with the underworld, it remains to be seen which new elements Sacred Games will bring to the table. Produced by Phantom Films, Sacred Games will begin streaming on July 6 on Netflix worldwide.